WAVELENGTH Science Fiction Conscience 13 JUPITER RENDEZVOUS ( Continueds From Page 11) ship one or two bulky mss. along. The pro mags are not shouting madly for more and yet more of my sort of tripe and I have already filled every room in our house, save the kitchen, to the roof with rejects." "Well!" I says as young Wells finishes, "that's sure brief and to the point. Many thanks for your fine offer, Basil . . . and don't be so modest about your writing ability! I read your "Human Mice of Kordar! in "Stirring" and I thought it swell! Let me know of your next ! All this time, I been noticin' out of the corner of my eye how restless Mr. Louis Russell is getting' so I ups and says to 'im, "O.K. it's your go now!" He starts out with," In general, the SCIENCE FICTION COLLABORATION suffers from hopeless organic disinjunction. The several articles, etc bear little or no relationship to each other, and the absence of any perceptible ediorial policy as an integrating influence leaves the fmz without either character or atmosphere. It is , in fact, not properly a s. f. fmz, but, rather, a collection of items pertaining to s. f. more or less haphazardly assembled. The fact that Claudius' news is dated and dry and that "The Real Star of Bethlehem", an oft- seen filler, detracts a lot. Kummer's article is verbose. I do not care 4 the fiction department. Except for the exact figures viven, what Wyn says is generally obvious to anyone of rudimentary intelligence. Wetzel does not seem to accomplish much ( no more than a captive squirrel taking his exercise! ) Why should a fmz publish an article like "Ad Astra?" Still, I found "Ad Astra" had some slight interest. The fish!" Our friend sits down after his say is over and I announce that that is all for the meeting. It's time for all of us to blaze our starpath again. An' that ends "Jupiter Rendezvous" until the next meeting! 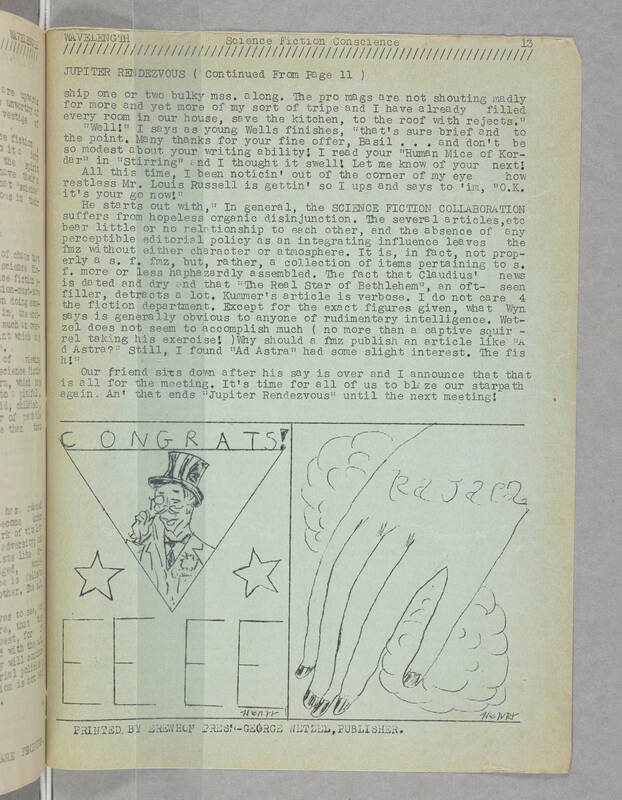 [line across page] [Image: page split in half, left half: cartoon of man in top hat and eyeglass, and the words 'CONGRATS! EE EE' right half of page: a lady's hand with painted nails, and the name 'RAJACZ'. Both sides signed Henry.] PRINTED BY EREWHOM PRESS-GEORGE WETZEL, PUBLISHER.